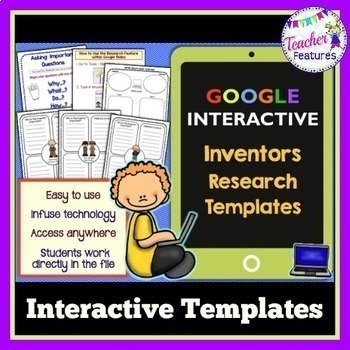 Google Classroom Writing FAMOUS INVENTORS | SCIENCE | These no prep graphic organizers focus on 12 famous inventors and are an easy answer to infusing technology into your classroom. Paperless, digital and engaging! This paperless resource contains everything you need to get your students started on a beginning guided research project! 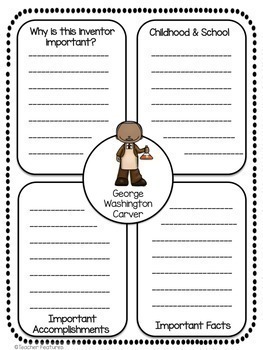 Follow the Guided Research Process and use the graphic organizer templates to teach your class how to navigate and organize information. 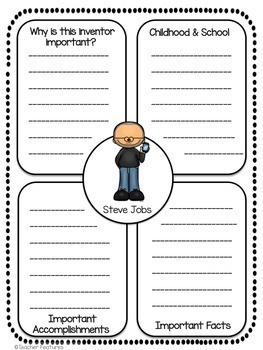 Students will create Important Questions (essential questions) to provide focus to their research. There are 12 Famous Inventors included in this bundle. Google digital lessons increase student engagement and are a perfect way to infuse technology into your classroom, while saving paper at the same time. laptop, or a desktop computer. You can access this product from any location! Interactive products for Google classrooms mean no more lost student content- Google saves automatically. *Google Drive has an option to print if you need to print a hardcopy of student’s work. When you purchase this you will receive a link in a PDF file. First, make sure you are signed into your FREE Google account. Click on the link and you will be prompted to "Make a Copy". Rename the product whatever you would like. It will be sent directly to your drive! Disperse to your students via Google Classroom or a Google Drive Shared folder.